A Reflection on Place, Collaboration, and the Fine Art of Bookmaking. Open a window…into the valley you love. In doing so, you discover a unique and inspiring place where natural beauty and a vibrant arts community come together for the common good. In this spirit, the Methow Conservancy, Door No. 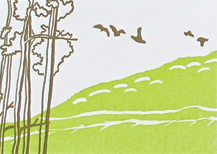 3, and some of the valley’s finest print and photographic artists – as well the hand-made book studios of the Mighty Tieton arts incubator (near Yakima, WA) – bring you a one-of-a-kind, collection of original art and poetry. Last fall, artists were invited to respond to the prompt, “The Methow Out My Window,” using the media of linoleum block print or digital photography. Select submissions were then paired with Linda Robertson’s collection of Methow poems entitled “Letters to Julia” to create the final book. Only 250 copies will be printed and proceeds from sales will support the Annual Operating Fund of the Methow Conservancy, a local nonprofit land trust. The book was designed and produced under the direction of Ed Marquand at the renowned Paper Hammer Studio in Tieton, WA with assistance from Methow Valley printmakers Laura Gunnip and Robin Doggett of Door No. 3 in Twisp. Laura and Robin, who bolster many local arts education efforts through their teaching and artistry at Door No. 3, have been thrilled to participate. 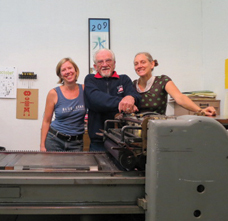 Not only do they appreciate working in concert with the Methow Conservancy’s conservation efforts, but the project has simultaneously strengthened their connection to the greater letterpress community via the working association with Paper Hammer. And the mentorship experience with an established studio has helped to further their vision for a growing letterpress & book arts operation at Door No. 3.